LONDON (AP) - It’s not often an artist finds himself occupying 12 rooms of London’s leading museum of British art and the front page of populist tabloid The Sun. But David Hockney is unique. For curators of a major retrospective opening this week at Tate Britain, Hockney is an innovator whose 60-year career has taken in sketching, painting, printmaking, photography and digital iPad experiments. His depictions of sun-dappled Los Angeles swimming pools and wooded Yorkshire hills are among the best-known images in contemporary art. To the tabloid, he’s a British icon, a “Yorkshire working-class lad made good,” famous for his round glasses, shock of blond hair (now gray) and contempt for smoking bans and other governmental intrusions. Last week The Sun asked the artist to redesign its red masthead for a day, boasting that this meant a “free Hockney for every reader.” Hockney created a cartoon-style logo of sunrays and shadow, using a drawing app on his iPad. The tablet computer is a favorite tool of an artist who continues to experiment as he approaches his 80th birthday. “The iPad has become his sketchbook,” said Andrew Wilson, co-curator of the Tate exhibition, which opens Thursday. 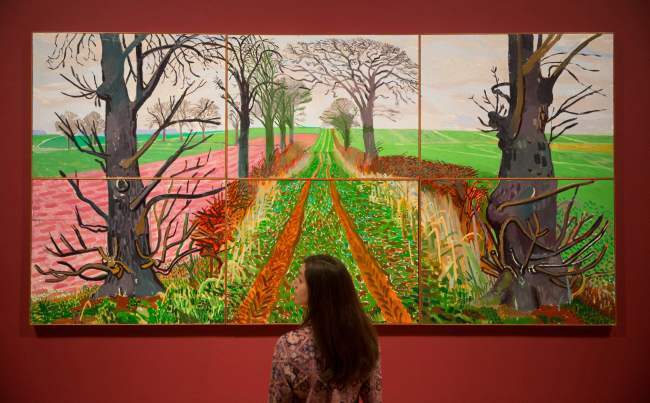 Wilson said that Hockney has always embraced the challenge presented by technology. “As a student, he was introduced to printmaking, so he wanted to master that,” he said. “And he has mastered it in so many ways, he’s pushed the boundaries of printmaking. Hockney’s iPad drawings fill the final room of the exhibition, which contains some 250 works in all: drawings, paintings in acrylic and oil, photo collages and videos. The oldest piece is a teenage self-portrait from 1954. The most recent paintings of his LA home were completed in 2016. In the early 2000s he looked afresh at the fields and forests of Yorkshire in a series of exuberant landscape paintings that combined bold color with minute attention to the texture of snow on a hillside or blossom on a hawthorn hedge. The show, which runs to May 29, is the fastest-selling in Tate Britain’s history. It moves on to the Pompidou Center in Paris from June 21 to Oct. 23, and New York’s Metropolitan Museum of Art from November to February. Alongside the artistic journey, the exhibition charts how a gay, working-class youth from the unfashionable north of England went from outsider to national treasure. In 1997 Queen Elizabeth II made Hockney a Companion of Honor, an award limited to 65 people “of distinction.” He is currently designing a stained-glass window for Westminster Abbey to honor the queen’s long reign. He had a minor stroke in 2012, but still paints every day. He told the Sun: “It’s my work that keeps me young.